If Daniel Humm were cooking in the northern, more Germanic part of Switzerland, he'd probably serve this spectacular roasted veal with spaetzle, but because he's in the southern, Italian region, he makes a luscious risotto with porcini mushrooms. Preheat the oven to 325 degrees. Season the veal all over with salt and pepper. Heat the olive oil in a medium ovenproof skillet. Add the veal and cook over high heat, turning once or twice, until browned all over, about 4 minutes. Add the sliced garlic cloves and marjoram sprigs to the skillet and roast the veal in the oven for about 45 minutes, turning the meat once or twice, until an instant-read thermometer inserted in the center registers 135 degrees. Let the meat rest for 15 minutes. Meanwhile, in a small bowl, combine the lemon juice and zest with the chopped marjoram and minced garlic clove. Season with salt and pepper. 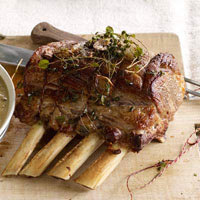 Carve the veal roast into 1/2-inch-thick slices and transfer to plates. Spoon the marjoram-lemon mixture over the veal and serve with Porcini Risotto. This entry was posted on 10:20 PM and is filed under Veal . You can follow any responses to this entry through the RSS 2.0 feed. You can leave a response, or trackback from your own site.